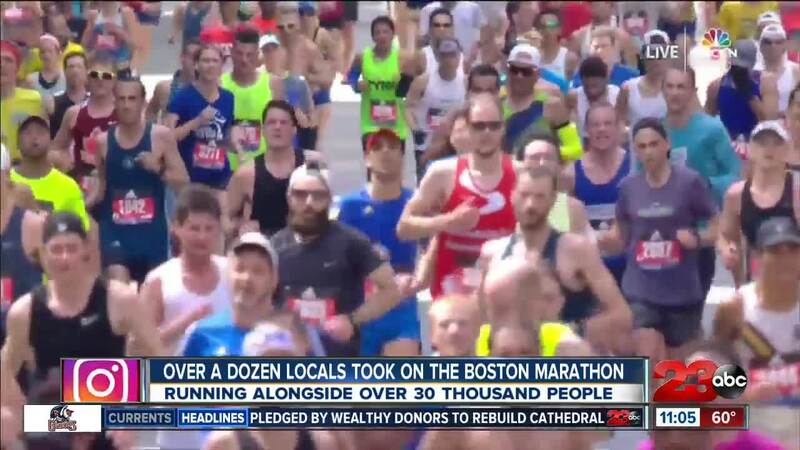 BAKERSFIELD, Calif. — The Boston Marathon is a 26.2 mile course that brings in tens of thousands of people from all over the world every year. Lawrence Cherono of Kenya beat out Lelisa Desisa of Ethiopia in a photo finish sprint to win the 123rd Boston Marathon in 2 hours, seven minutes and 57 seconds, claiming his first major victory. And, while Cherono represented his country, over a dozen represented Bakersfield. "That whole last mile is just so loud," said Bakersfield resident, Ryan Lucker. "So much screaming and so much cheering. It doesn’t matter how you were feeling for [those last miles], those people are definitely going to bring you in." The Ridgeview teacher and coach came in on top for Bakersfield at two hours and 53 minutes. “I'm a little gimpy," said Lucker. "I’ve never been this sore after a marathon for quite a while. I’m happy to have completed it because I know for about six miles there I was fighting myself mentally. My body was cramping up. I was just tired." Just like Lucker, the physical and mental toll was on the mind of many other local runners, but their determination got them through it. Roberts says his training definitely paid off. He says he ran for nearly 900 miles in 16 weeks. “It’s a great experience," said Lucker. "One that everybody should strive to have at one point."